The 4103C is a high specification, 100mm strip chart recorder, providing continuous recording for up to 6 Process Variables. Information such as Channel descriptor, alarm set point and scale information can be viewed on a high resolution VFD display. Process variables including messages can be archived to an optional removable media. These units can be programmed on site via the user interface or a configuration file can be transferred using a PCMCIA card. Configuration: User configuration is password protected. In addition to instrument configuration selected fields can be defined for operator access. These fields will be enabled in the operator access menu. 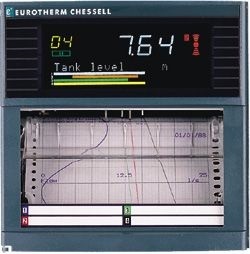 For continuous trace recorders the traces are separated in the time axis of the chart by 2mm, this results in simultaneous events being separated on the chart by 2mm. When enabled on the 4103C, Pen offset compensation applies a delay to the pens, the time delay being determined by the selected chart speed, such that simultaneous events appear on the same time axis.